When I saw this beautiful, beachy Martha’s Vineyard house featured on House of Turquoise, I immediately thought of the one from Something’s Gotta Give. So I had to laugh when I got to the end of her post and she asked if it reminded anyone else of the SGG beach house. Apparently I wasn’t the only one! Let’s compare them, shall we? They’re obviously not identical–it’s not like the Martha’s Vineyard room is a copy of the movie set–but they share a similar kind of style. Even the front doors look related (love them!). Again, not a copycat version, but you can definitely see the influence in the cabinetry, the subway tile, the light fixtures, and even the drawer pulls. Which version do you prefer? 2/11 UPDATE: I just heard from the designer, who says, “I, too, see the similarities. The funny thing is that this house was 4.5 years in the making, beginning in 2002 – before the movie came out! (For the record, I have never even seen the movie – nor the images of the set design)! It was not until people began comparing my work to the movie that I ever even looked it up!” Isn’t that interesting? Thanks, Arden! Love the Something’s Gotta Give house? You can see my post about it with more house photos here. Or visit TV/Movie Houses to see them all! How They Built a Glass House for "The Lake House"
I love both of these rooms and end using them for more inspiration file. White kitchens are my favorite! Glad I’m not the only one who noticed the influence! Both such stunning homes! 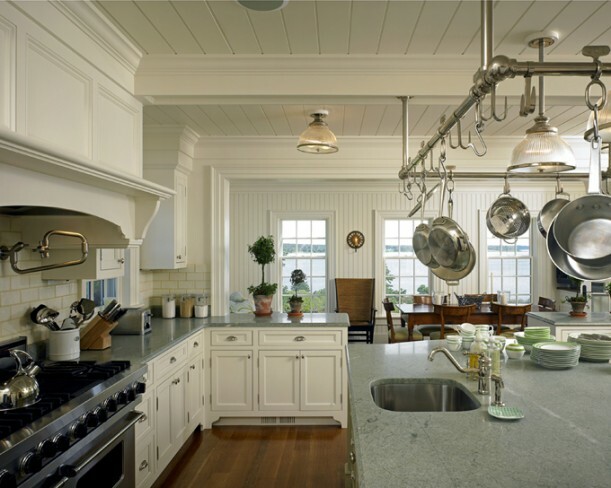 I think I prefer the kitchen in the Martha’s Vineyard home. But I LOVE that pieced-together striped rug in the SGG home. Either would be a dream to live in though! You know I love SGG!! Love this house and everything in it! I love all of the rooms, but I think I kind of like the Martha’s Vineyard’s rooms a little better than the rooms from the movie. Sigh…. Julia I love Arden’s work!! Very nice! Thanks to Erin for featuring it and letting you know!! These two houses really are similar to each other. I like this house better than the one from the movie though. It’s so gorgeous and I can totally see myself living in it. I love the movie and the movie house and also the Martha Vineyard version. 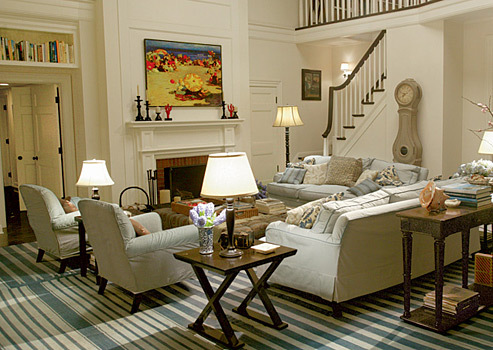 I particularly love the room with the striped rug in the movie home. I could live happily-ever-after in either home. I had the exact same reaction – and then laughed when I reached the end of the post. A beautiful house indeed – will have to check her portfolio to see the rest of her work! Wow – they are both beautiful! I don’t think I would even know how to pick! Oh my god!! I am absolutely drooling over this house! What a beautiful kitchens! I like them both, but the movie one best. It’s a little cozier I guess. Thanks for posting! Love it, Love it!! Love both homes.. so pretty. Thank you for sharing. SGG kitchen gave us the inspiration for our kitchen makeover. I love the Martha’s Vineyard home a bit more, just because its a real place. The warmth mentioned in the other posts is probably due to expert movie lighting. The colors used are so similar. Gorgeous in every single detail, and this kind of house is very common there, so it doesn’t surprise me , but I’m in love with the interiors. Bookmarked!!!! Gorgeous, the both of them. You just showed my favorite movie house ever…which I’ve mentioned before. Which I looked up on your blog yesterday (for the 400th time), which I told myself I can never have and that NO one really lives like that. “It’s just a movie.” I told myself. And now this! THIS! I’m going into the “ugly cry” thanks to you. I’m now headed for an overdose of Poptarts this morning in my quite ugly kitchen and home that will never be a beach house in Kansas. Sigh. Double Sigh. Kimberlee, I feel your pain! I can’t even count the number of times I’ve watched that movie…and mostly its just to drool over the house. I’ve accepted the fact that while I may never have a house in the Hamptons, Martha’s Vineyard, or even the North Carolina coast, I CAN have an interior reminiscent of these homes. And so, I’ve been working on eliminating my vibrant-colored interiors and slowly, but surely creating the soft, dreamy, cozy, beachy interiors as seen here. It may take the rest of my life, but at least I’ve started…my beach house in western North Carolina! Both of the houses are beautiful and make me wonder whether the Martha’s Vineyard one was influenced by the movie. I do prefer the SGG house exterior, because it has less details but like the MV’s kitchen better. But nothing beats the master bedroom with it’s study area in SGG, ah but to have a space like that! Oh my! I would love either home. I have to admit to watching SGG for the sole purpose of seeing the house again and listening to the soundtrack. It’s my relax, kick back, feel good movie. Just love, love, love it!! Bwaaa, I’m so jealous…people really live like this, and I’m not one of them! OK, I’m over it. Sorry for the outburst. I think I like the MV house a little more, I like the lighter kitchen counters; that was in the MV house, right? But I like like the cream dishes in the dining room, or do I? I can’t decide. Actually I would live in either one, even if one was just a movie set! SWOON. Love this style…I’m all about white cabinets, subway tile backsplashes, and what about that blue granite in the MV kitchen! I really prefer the plaid rug in the MV house over the striped one in SGG…I am a symmetry gal. Love the color schemes in both houses. Beachy and cozy! I totally agree with The Little Red Shop’s comment. I could take a nap on those kitchen counters! 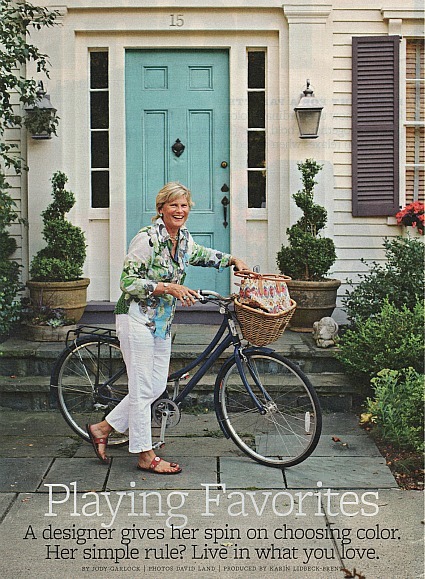 Love the Martha’s Vineyard home — beautiful architecture, elegant decor and location, location, location! This house is gorgeous! 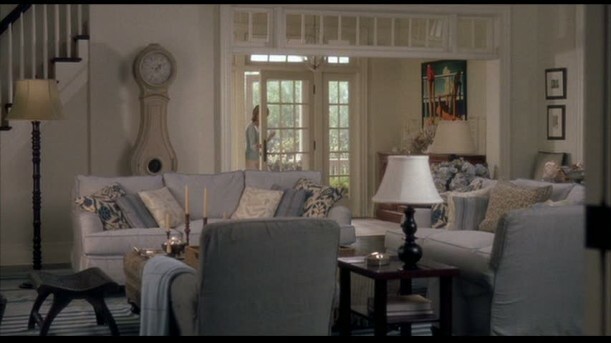 I love the house in Something’s Gotta Give (thank you again for such a lovely and comprehensive post on it!) and this house has a kitchen and living room that is equally as lovely. I love the clean colors and the openness of the layout. And I have a new favorite house…. Now THAT is a beach house!! Love both, but the MV one is real. I would soften the rest of the rooms/make not so matchy-matchy but the kitchen/living rm – wow! So much alike. Can’t miss that real beach light in the MV house compared to the studio lighting though. Plus, I’m all about the round table in the SGG dining room – love a round dining table. Hi Julia….MV one of my fave places on earth….and that home OH MY !!! I think I like the MV best……love the striped rug too. I wanted to pop in and say hello….life has been a bit hectic…..my MIL passed away and my Mum is living with us after a bad bout with shingles….she is slowly getting better thank God…. I hope all is well with you and yours….thank you for this post it made me smile. I’ll take both thanks…if only Hi Julia this is great thank you for sharing but I have to say the artwork in the SGG house is very uplifting it just ads colour to your day the other house is beautiful but a bit dull. Regards Esther from Sydney having a dull past few days (cloudy with no rain). I love everything about this house! The simple classic clean decor, the art, the furniture, everything! I LOVE, LOVE, LOVE this house!!!! Anyone have an idea of what the countertop surface is in the Turquoise house? Grayed-out soapstone? Marble? Something synthetic like Silestone? Love it. I would have liked to see a pop of a coordinating color in the Turquoise house – like coral. I see the resemblance, and I’ve always loved the SGG house. But, I love the countertop of the MV house and all the beautiful woodwork! Fabulous! There is no way the designer wasn’t influenced by the SGG house! They are way too similar for there not to be some major inspiration going on. I looked all over for the Rockaway Beach painting and others from this house and finally found someone who would do them. Canvas replicas. http://www.canvasreplicas.com If you are looking for the art from the beach house they will do it. Great beach house, great movie! I saw the thumbnail of this one and thought it was our house! I think this is one of the prettiest kitchens I have ever seen…and that view through the windows! Oh my!! !